Fully scalable to any size company – whether 20 employees or 5,000. Sync with Outlook or GroupWise calendars for automatic status updates. Completely customizable to fit into any industry. Update and view from any location using a kiosk, an Internet browser or your smartphone. Eliminate paper methods, and simplify work life for everyone involved. In addition to savings in staff accountability, the process of accounting for visitors and contractors has also become more accurate and efficient. I think it's really hit the nail on the head. It has accomplished everything we'd hoped for. The EIOBoard system worked so well for Forensics, we've implemented it into the rest of the DPS [...] We now have a secure way of protecting critical evidence. We also use [EIOBoard] just to see who's available. When we need to talk with someone, we'll check the EIOBoard before getting up and walking to their office." EIOBoard is a simple, easy-to-use, and fully customizable electronic in out board software solution with several different interface options (incl. desktop, online, kiosk, and mobile) all working simultaneously in real-time. 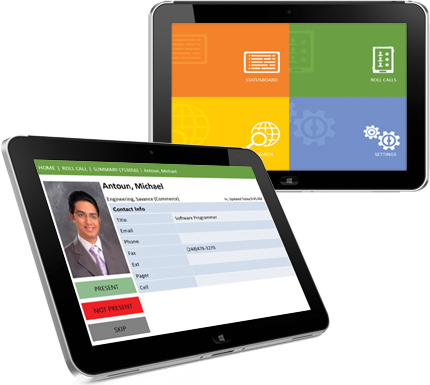 Use EIOBoard for employee attendance tracking and status updates, electronic time cards, visitor management, inner office communications, and more. 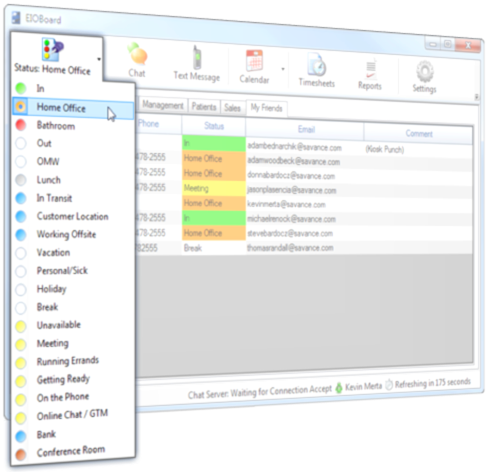 Integrates with Microsoft Outlook and GroupWise. With EIOBoard electronic in and out board, you will be able to eliminate your old wall-mounted magnetic whiteboard, paper in out sheets, outdated receptionist software, sticky notes, and note pads. Upgrade to a real-time, complete solution for your entire company, office, or building. Our electronic in out display boards are easy to view, and color coded so onlookers can quickly see the status of any or all users at a glance. Also use EIOBoard to send private instant messages, leave phone messages electronically, create shared calendars, and more. 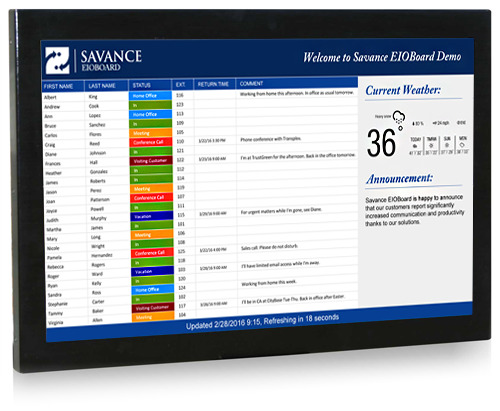 Savance EIOBoard is fully customizable to fit into any industry, and we will work with you to develop a solution that fits all of your needs, as well as your company's branding and color scheme. Our current in/out board-based solutions include Emergency Mustering, Staff Tracking, Time & Attendance, Visitor Management, and more. Enhance communication throughout the entire organization with secure instant messaging, notes, text messaging, and group chats. Easily go back to review chat history as needed. Employees can access EIOBoard from anywhere using an Internet browser or a mobile device, or simply update their status by sending a text message. 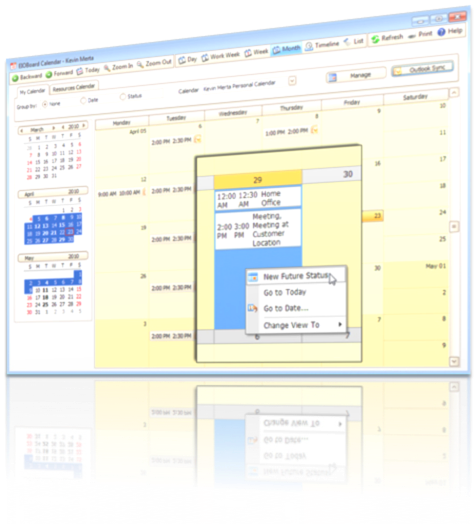 In addition to the built-in calendar features in EIOBoard itself, the software also offers a familiar, easy-to-use interface that integrates and syncs with Microsoft Outlook. Easily change your status from within Outlook (even automatically, based on your calendar), read notes, send text messages, initiate private chats, and more. EIOBoard also supports syncing with GroupWise. 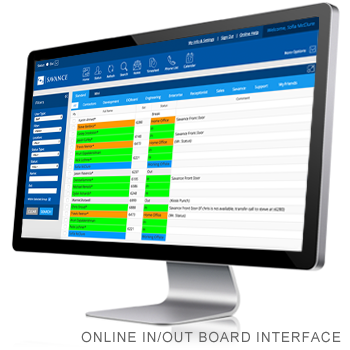 With EIOBoard in out board software, users can quickly update or change their status using some general statuses such as In, Out, At Lunch, On Vacation or In a Meeting, as well customize the in out board by adding, deleting, or changing any of the options. For larger corporations, EIOBoard in out board software can be quickly setup to use multiple groups within your company, such as Sales, Customer Service, Accounting, Management, Engineering, Patients, Doctors, Nurses, Friends, or any group you want to create. Not only can the EIOBoard electronic in and out board software track employees, it can also track guests waiting in the lobby, sending alerts via email, desktop popup message, or SMS text message to the host when a guest arrives. View guest information with just a quick glance. For a complete Visitor Management solution, you can choose to add options such as a self check-in kiosk, visitor camera, visitor label printer, and more. 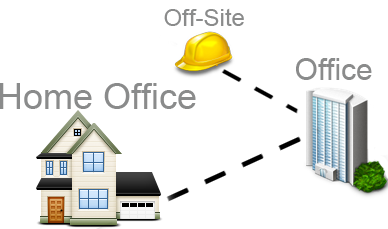 The EIOBoard in out board is able to track the status of off-site employees, so employees will never be out of reach from the office when working from another location, or from home. 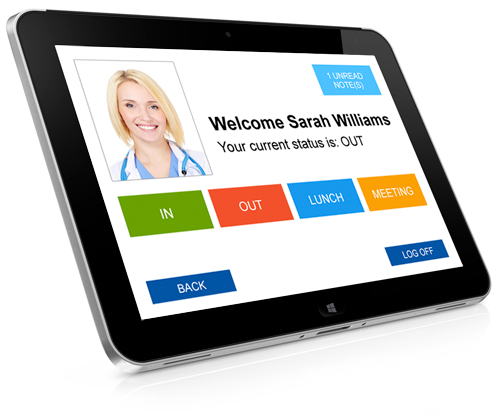 The in out board allows employees to easily check in and out, and be able to easily communicate with coworkers anywhere in the world. EIOBoard offers a lot of different hardware options for setting up your company's electronic status board solution, and can customize any solution to fit your needs. 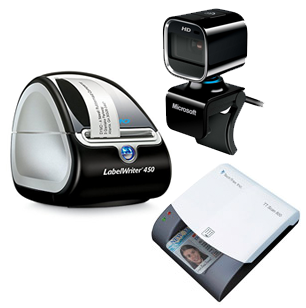 Access Control or Telephone Integration: Integrate with your access control or phone system for automatic status updates. Active Directory Sync: Synchronize specified organizational units down to individual users. Built-In Reporting: Run built-in and custom reports, including in/out history, late returning, time and attendance calendar, and more. Company Announcements: Easily post company-wide information and announcements to all users. 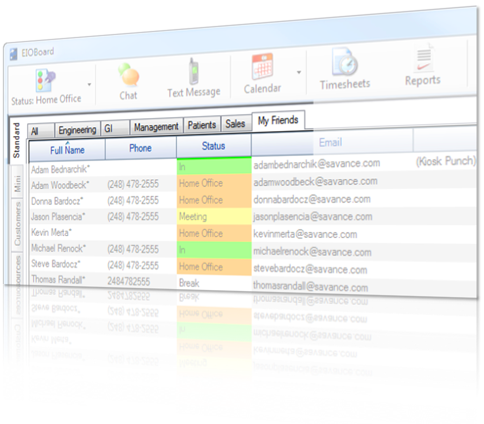 Contact Management: Retrieve any contact information right from the EIOBoard application. Future Status Scheduling: Schedule automatic status changes based on your future schedule. Presence Sensing: Change a user's status automatically due to a particular variable or environmental change. Text Messaging: Send a text message to any phone from within EIOBoard. EIOBoard setup requires hours, instead of days, compared to other products on the market. Our team of professionals are here to help during the entire process. As you move forward with your new EIOBoard solution, know that Savance is constantly upgrading and improving our products to include new features and to handle any compatibility issues. EIOBoard releases annually to keep the software current and up-to-date, and we are always preparing for the next release. Updates are automatic and painless. The EIOBoard software offers more return for your dollar than any software on the market. EIOBoard comes standard with more status board features than any other product on the market. You will get a complete status board and more, without breaking the bank. 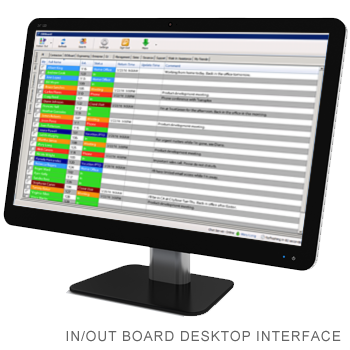 Giving your employees the option of several different interfaces makes EIOBoard a solution that's also convenient for every user. Whether you are a company consisting of 20 or 5,000 employees, a single location or ten, EIOBoard is flexible to meet your needs. To create easy visibility for larger corporations, the solution can be quickly setup to use multiple groups within your company, e.g. Sales, Customer Service, Accounting, Management, Engineering, Patients, Doctors, or Nurses. EIOBoard can be completely customized to fit into any industry. We offer expert advice and will help you tailor features to meet your company's needs. We also offer custom design for Visitor Management and Staff Tracking kiosks, large screen display boards, and more. All EIOBoard solutions tie in seamlessly with one another, including Emergency Mustering, Time & Attendance, and Visitor Management, for a complete, all-in-one solution for your business. 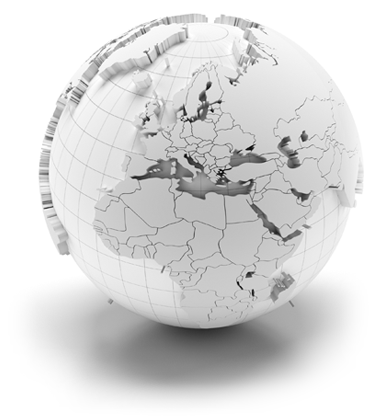 We also integrate with third party providers of e.g. Access Control solutions, to extend the use of new or existing door system. EIOBoard provides you with online and desktop-based calendars, so you can see all events and appointments for the day, week, or month. You can also easily sync with your Microsoft Outlook or GroupWise calendar, which in turn can update your status automatically. EIOBoard will simplify work life for everyone involved, by allowing you to eliminate those paper methods of keeping track of employees' statuses, check in and out time, and time cards. 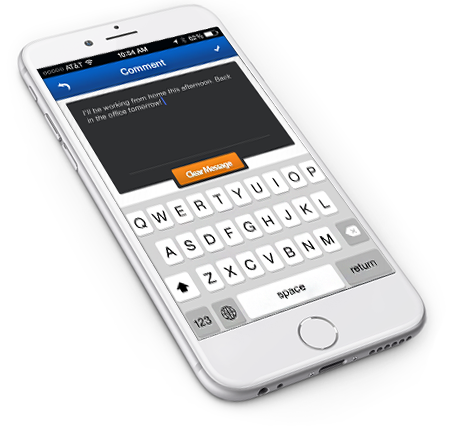 You can even use EIOBoard for chatting, text messaging, or for simply sending an electronic note to another employee. 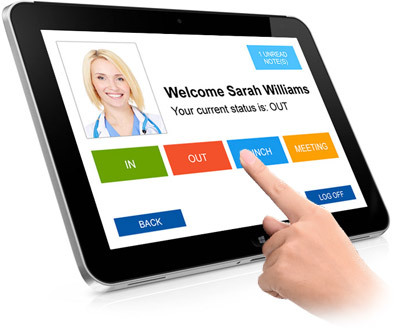 The status board allows receptionists and administrative staff to have a complete status of everyone in or out of the building, including offsite employees. Not only can EIOBoard track employees, but it can also track guests waiting in the lobby, allowing staff to be alerted when their guest arrives. 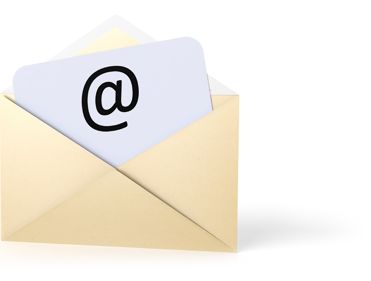 Try to call or email Savance to see how quickly you receive a response. With EIOBoard, you'll always get attention very easily and very quickly. We want to take care of our clients at all times, and make sure they are happy with both EIOBoard and with the Savance team. The application interface of EIOBoard, which is included with any base package EIOBoard purchase, offers an easy-to-use, Microsoft Windows-based interface for the in out board system. The application interface comes with features such as private chat, group chat, idle timer, telephone and presence sensing, and calendar sync with Microsoft Outlook and Groupwise. The EIOBoard Browser Interface is available through any web browser on any operating system, including Mac and Linux. 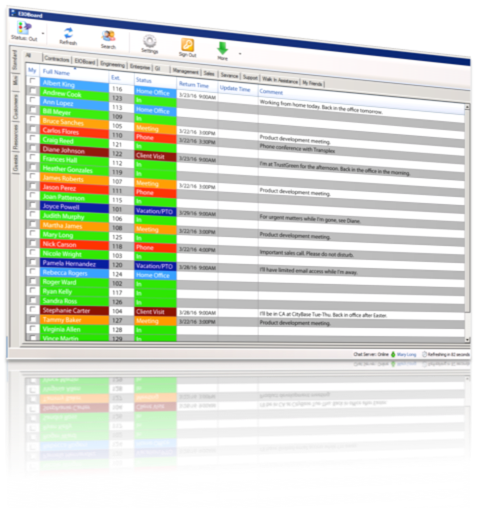 The online in out board interface has many of the same features that the application interface offers, such as the calendar, reporting, employee status filter, employee contact information, online chat, and more. Using the EIOBoard add-in for Microsoft Outlook, users can easily view the status of coworkers and update their status from within Microsoft Outlook. 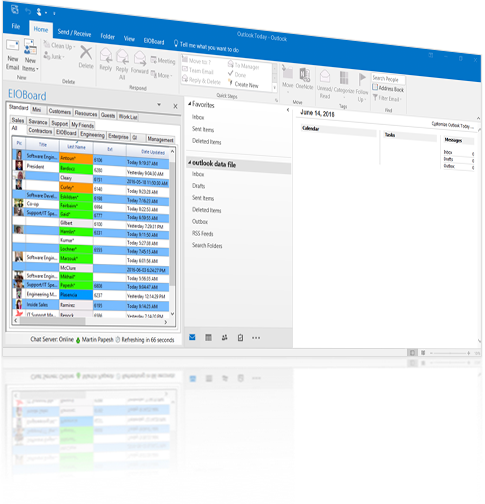 The Outlook in out board offers the same features as the regular desktop version of EIOBoard, and allows for easy, automatic status updates based on your Outlook calendar. 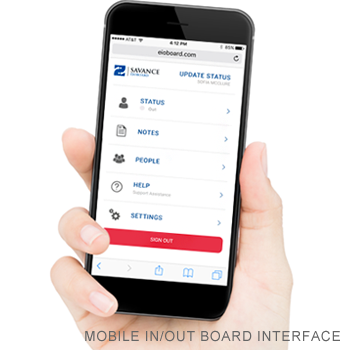 EIOBoard's mobile in out board apps for iOS (iPhone and iPad) and Android were designed to allow users to quickly update their status, view other people’s updates, read notes, send messages, and much more. It is a complete mobile status board solution when out of the office. The apps come with optional GPS tracking, and automatic status updates based on location. No iOS or Android device? 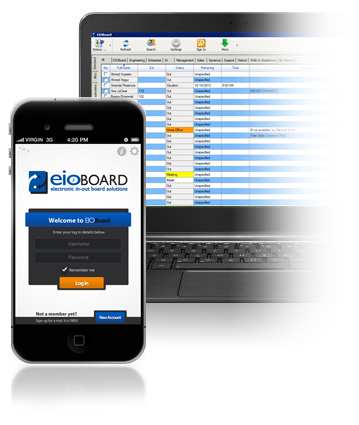 EIOBoard also offers EIOBoard Mobile, a web-based in out board application accessible through any mobile device. 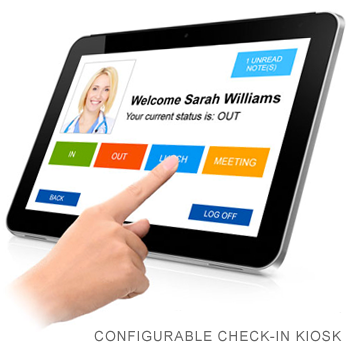 The optional EIOBoard kiosk interface runs on a strategically placed touch screen kiosks, allowing users to update and view their status and read and reply to notes. The kiosks can be customized to suit your branding, and —same as with other EIOBoard interfaces— status messages are fully configurable. Our kiosks support card readers and other hardware, and can integrate with any Access Control System. 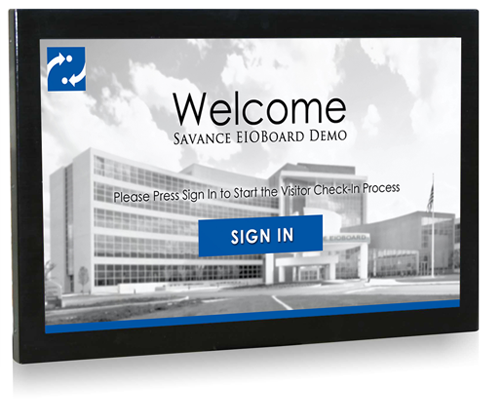 Extend kiosk use with EIOBoard Visitor Management. By adding large screen display boards to entrances, lobbies, and other high traffic areas, you can turn EIOBoard into a large Electronic Whiteboard. This way, employees and guests can instantly see who is in and out, as well as view locations and contact info. EIOBoard's large screen displays are color-coded, fully customizable, support mixed content, and are available in a number of different sizes. The EIOBoard offline interface is part of our Emergency Mustering solution, and offers an up-to-the-minute electronic tool for roll call during fire drills or emergency evacuations. Using a Windows tablet or laptop, the offline interface kicks in when network connection is lost, and lists everyone that was signed in or out at the moment of the emergency, allowing safety officers and emergency workers to pinpoint a person’s last known location. 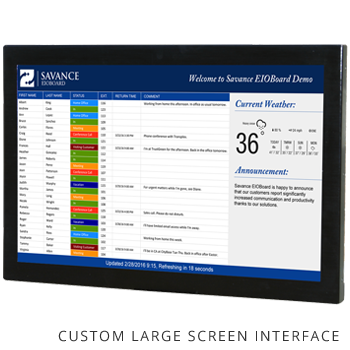 All Savance EIOBoard solutions integrate fully with one another in order to create a complete, all-in-one solution that is customizable to your specific needs. Whether you are interested in several solutions or just one, Savance will put together a software/hardware package customized to your exact needs. Contact us today to find out more about our EIOBoard electronic in/out board solutions, and our customization options, or to sign up for a free web demo! 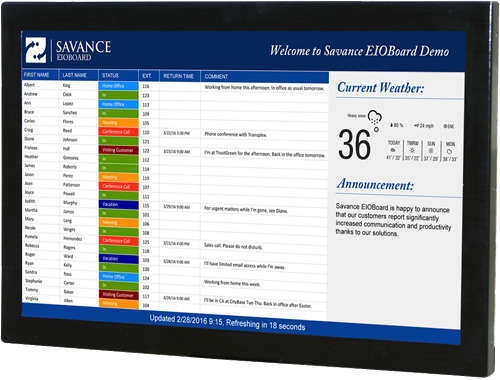 Savance EIOBoard offers a number of electronic status board solutions, including Emergency Mustering, Staff Tracking, Visitor Management, and more. All EIOBoard solutions integrate completely with one another. We offer a Free Demo on all solutions. 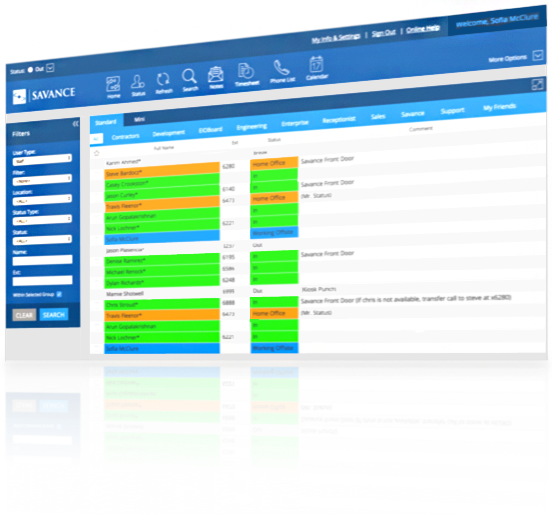 For healthcare-specific solutions, make sure to see Savance Health.